Change Windows Vista boot screen finally has a easier ways to use hight resolution images or photo as your windows vista boot screen. Perhaps all of you already sick with original windows vista boot screen with black screen and status bar only.You can even automatically generate the replacement language MUI file that contains your boot image files. 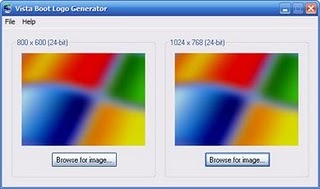 This Windows vista logo generate tools is totally free. After go through the step, You can view your new windows vista boot scree. If you facing some booting problems with Windows vista, You can use the windows vista install CD boot up to replace the winload.exe.mui file with your backup.